Clobbered by Wall Street. Fierce competition from Google. 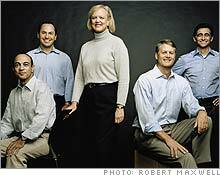 Meg Whitman's had a rough couple years. Fortune's Adam Lashinsky finds out how she's trying to turn eBay from ultra-hot to built-to-last. (Fortune Magazine) -- Meg Whitman is waiting in her personal meeting room at eBay's headquarters in San Jose, otherwise known as the Blondie room. It is eBay's corny tradition for a top manager's peers, or, in her case, Whitman's direct reports, to name their meeting room for them. Whitman's is an homage to her golden locks and down-home persona. (For years, the CFO's redoubt has been called Scrooge; the room assigned to eBay's new president of its marketplaces business, John Donahoe, is known as Dennis the Menace.) Between meetings Whitman has been sneaking a peek at PowerPoint slides prepared for an upcoming meeting of eBay's board of directors. During an hour-long touch-all-bases interview she discusses everything from eBay's controversial acquisition of Internet phone-calling startup Skype ("I'm more excited about this today than a year ago," she says) to her management philosophy ("It's okay to make mistakes as long as you fix them quickly"). Whitman says she's spending the bulk of her time these days on people ("No. 1 job of a CEO") and on strategy. She notes, with only the slightest hint of resignation, that on the Internet "the landscape changes quarterly," elevating strategy to a mission-critical task. Yet Whitman's hardly soaking up the glory these days. Investors have pummeled her stock, slicing it in half since its December 2004 high of $59. They're on her case over a host of issues. Growth at eBay's core auction business has slowed, and while revenues are expected to grow 27% this year - that's a comedown from the growth rates of yore, and the trend has been steadily downward. Promised synergies haven't yet materialized between eBay and Skype, which Whitman bought a year ago for as much as $4.1 billion, depending on how Skype performs. While hypergrowth outfits are supposed to blow through expectations, Skype is merely hitting the financial targets eBay promised when it bought the company. What's more, eBay is facing unusually fierce competition in China, South Korea, and Taiwan, crucial markets for international expansion that Whitman has traveled to repeatedly. Given all that, it hasn't helped that several key members of her senior management team - a group that's largely been together since the dot-com days - have quit over the last year. Whitman has also stopped talking about how long she'll stay at eBay. Last year she flirted briefly with the CEO spot at Disney (Charts) that went to Bob Iger, and years ago she publicly predicted she'd leave eBay after a total of eight to ten years - in other words, right about now. Of course, these are hardly the end times for eBay, unless you subscribe to the yesterday's-hero-is-today's-bum scorekeeping method common in Silicon Valley and on Wall Street. eBay's "slowing," in fact, is a deceleration from a growth rate that stayed stratospheric for years - and even accelerated in the mid-40% range as the company got bigger. Even now, eBay is robustly profitable. Its operating margins should hit 33% this year, down a couple of points from last year because of investments in Skype, but still world-class. Still, as eBay executives freely admit, the company is at an inflection point. It has been an Internet darling, but now it needs to be a grownup. "In the early days, even when we'd screw up, it worked anyway," recalls Gil Penchina, a longtime eBay executive who recently became CEO of Wikia, a for-profit company started by the founder of Wikipedia. Says Whitman: "I don't want to be Pollyannaish about this, but from the beginning we have [emphasized that] the stock price is not necessarily the only measure one should focus on." Employees understand, she adds, that they're helping eBay's buyers and sellers make a living and that they're making a difference. The looming challenge is to mesh that mission with the inexorable drag of size and age - and the double-barreled threat of new markets and new competition. The best way to understand where eBay finds itself is to examine its complex relationship with Google (Charts). The Web world revolves around Google today just as it once put eBay at its center. In part, the contrast is symbolic. It's no coincidence that eBay's stock peaked four months after Google went public and that Google has created $120 billion in market value during the time that eBay lost about $17 billion. (eBay is now worth about a third of Google.) The types of investors who once salivated over eBay have moved their attention to the new star of the moment. At the same time, eBay is also one of Google's largest customers. It buys a ton of ads on Google to drive traffic to auctions. Plus, the two recently forged a deal to promote Skype calls on Google and to place Google ads on eBay in markets outside the U.S. Yet Google is also a thorn in eBay's side. For years eBay's sheer size made it the preferred place for online buyers and sellers to meet. Today, though, sellers use cost-effective ads on Google to drive buyers directly to their own Web sites, making Google a brutal, if indirect, competitor to eBay. Google has also launched direct attacks, such as its Internet-calling product (Google Talk), its payment- processing system (Google Checkout), and its classified site (Google Base). "The Google issue is not to be understated," says Christa Sober Quarles, an analyst with Thomas Weisel Partners (Charts). "Every time eBay goes in one direction, Google seems to be there." Whitman knows that eBay's only alternative is to keep moving. The company has started its own international classified site, Kijiji, which operates in 11 countries but hasn't started charging for listings. It bought e-commerce sites Shopping.com and Rent.com to dig into the retail and real estate worlds. It has bulked up PayPal and Skype with acquisitions. Whitman says her strategy boils down to three critical synergies among eBay's properties: that eBay buyers and sellers will talk over Skype (generating ad revenue for eBay); that Skype callers will use PayPal to pay for their calls (the ones that aren't free, that is); and that Skype will encourage PayPal's expanding cross-border remittance business. It's all part of a plan to define eBay 2.0. "What it takes in the first ten years is a little different than what it takes in the next ten years," says John Donahoe, president of eBay's worldwide marketplace businesses, which account for 73% of the company's revenues. Donahoe is all about coming up with ways to get eBay to think like the large corporation it has become. "There's a big difference between a hot company and a great company," he says, in a thinly veiled swipe at Google. "This place has all the genetics to compete," he continues, karate-chopping the table for emphasis - and not lightly, either. Being a mature company, however, means being patient. With rumors swirling in the Chinese press that eBay will sell its eBay EachNet subsidiary, I ask Donahoe if eBay could contemplate abandoning China, as the company did in Japan in 2002. He replies that eBay will consider its "strategic alternatives" in China, including partnering where necessary in order to stay in the game. "What we're looking at in China is how can we succeed over a five- to ten-year period," he says, sounding very much like an executive who plans to be grappling with this issue at the helm of eBay for, say, the next five to ten years. Back in conference room Blondie, eBay's current CEO says she's fully engaged, but she also points proudly to the responsibilities her individual business-unit heads have assumed. Longtime CFO Rajiv Dutta, for example, took over PayPal when Jeff Jordan left; Alex Kazim, a veteran marketing executive, now runs Skype. Toward the end of our interview, while we're talking about Google, Whitman says: "It's very hard to do more than a couple things very well," a variation on the snickering in Silicon Valley that Google's helter-skelter product development isn't serving it well. I point out that eBay is also trying now to do many things at once: auctions, fixed-price sales, classified ads on a global basis, Shopping.com, PayPal, Skype, and so on. She counters that eBay may be busy, but it isn't diluting each business by shoehorning it into an eBay template. "Brands stand for something," she says, which is why eBay hasn't eliminated the Skype or PayPal names. Of course, if eBay is becoming merely a collection of brands, it will most resemble Barry Diller's IAC/InterActiveCorp, an e-commerce conglomerate that is an also-ran in several categories. Meg Whitman's joke at eBay used to be that the eBay community of users runs itself so well that "a monkey could drive this train." Not anymore. As of presstime, the only train-driving monkeys at eBay appear to be these adorable Curious George engineer plush toys going for $14.99.